What are you asking for this holiday season? I bet it’s not some random sweater or perfume. I would even go a step further to say you’re probably hoping for one or two really great gifts, vs receiving a bounty of mediocre presents. Am I right? As I’ve grown up, I’ve realized it’s not about the quantity of gifts I give and receive, but the quality that makes the gift worthwhile. You should have seen my Christmas wish list as a kid – I know my mom still has some of them highlighted in old scrapbooks, so you probably could call her and find out! Basically, it was just as you would imagine. Childish. I often requested dozens of frivolous gifts like Polly Pocket, Beanie Babies, and the many variations of Barbie. As an adult, my list has grown quite thin. I want fewer, better gifts. Especially lately, since I’ve been attempting to keep my closet organized and cleaned out – I’m trying to discard unnecessary items and get rid of the clutter. You know all about my black tote that I wear constantly, but as much as I wear black, I also wear a lot of lighter neutrals. On my holiday list this season was a similar style tote in a creamier neutral shade. 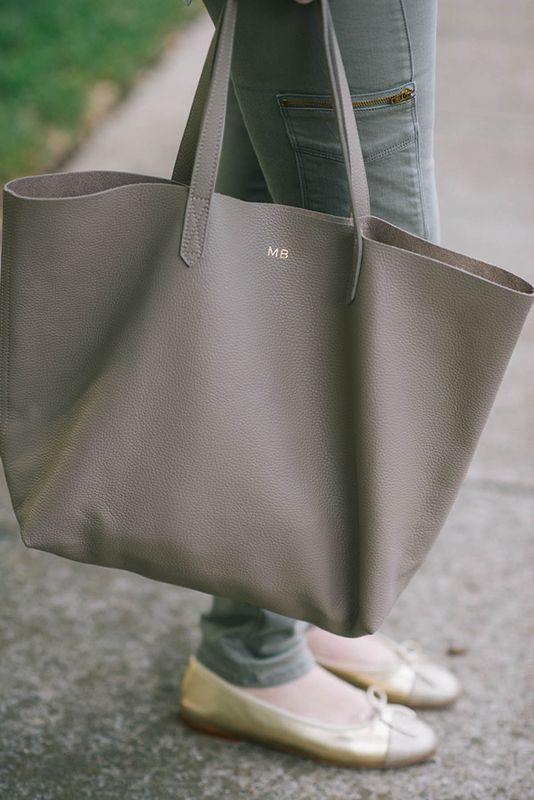 This stone gray tote from Cuyana was the ideal choice and the fact that I could make it my own with my initials sealed the deal. While Cuyana’s mantra is to celebrate fewer, better things, you won’t be getting any sticker shock here. You won’t find many products over $200 on the site, but you also won’t see any skimping on quality. Cuyana is a wonderful destination for holiday gift giving – the products are luxurious, the prices can’t be beat, and almost every item can be personalized. They also came up with a cheeky and fun way to share hints with your family and friends of what you want for the holidays with their Give A Hint app! Click here to learn more about Cuyana and shop their amazing selection of holiday gifts! Love these jeans and scarf! I love a good tote and I need to check out your rings. Cuyana!!! Love. 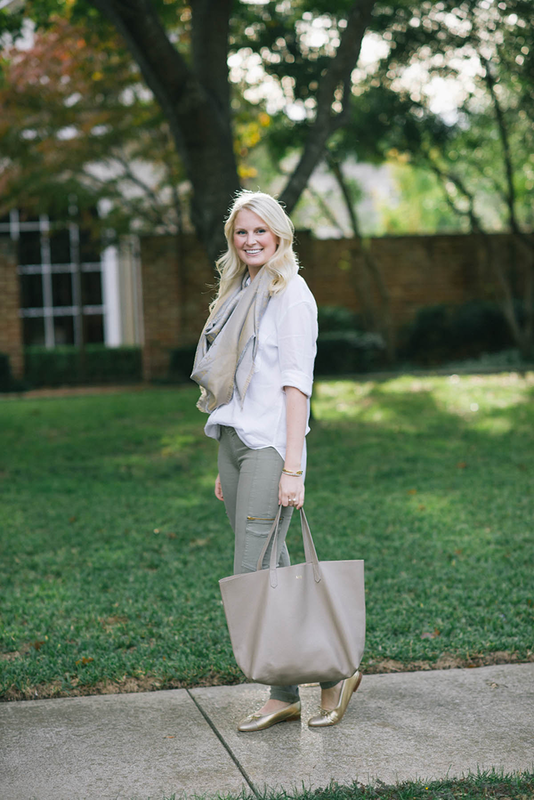 That tote is such a great everyday bag…I use mine all the time. 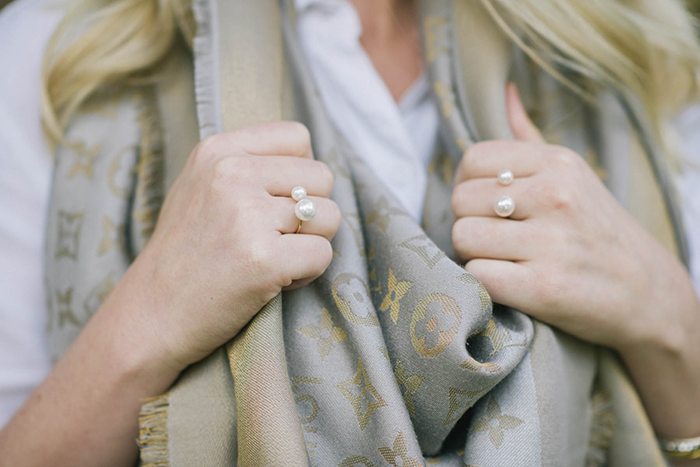 Love your LV scarf too. Great color palette. I totally agree with you about investing in quality pieces that will last a lifetime! I always ask for a handbag (Duh) and a pair of good boots! I really love your tote with the monogram. It is such a lovely color! You do chic so well. I love the tote. That would be a great Christmas present. The pearl rings are what really stood out to me. Love! My Cuyana tote is my obsession – love the color you chose! I need a cuyana tote in my life! Loving the colors of this outfit Merritt! I completely subscribe to the less is more strategy when it comes to gifts – I’d much rather have fewer gifts that have more longevity and are of better quality than a lot of so-so gifts. I scarf and shoe combo is really fantastic – so subtle but definitely anchor pieces for the look. This is sooo cute! I am loving this neutral look and that bag is so pretty! Love the shape and shade of that bag, so pretty! I love this neutral look! 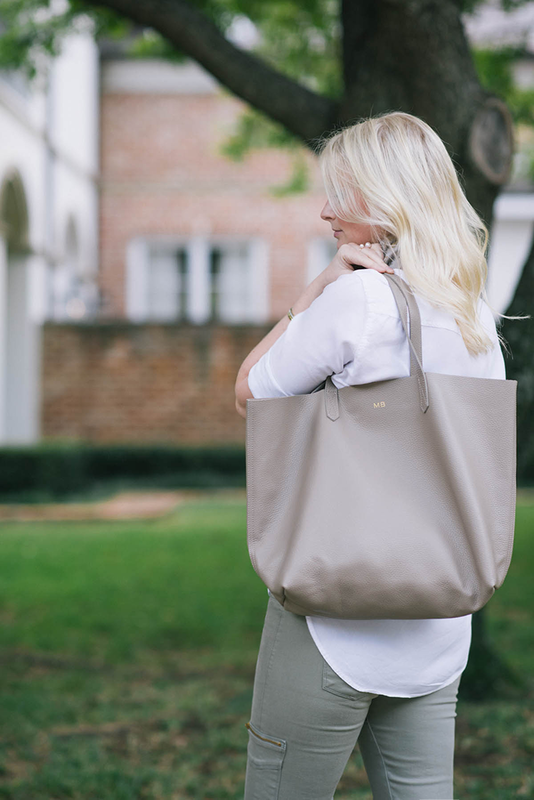 That Cuyana tote is the perfect staple. It will go with absolutely everything. Well worth the investment. And I love how you styled your jeans. I have a similar pair of cargo skinny pants and I’m never sure what to pair them with…thanks for the inspo!! Love all these soft colors of this outfit! 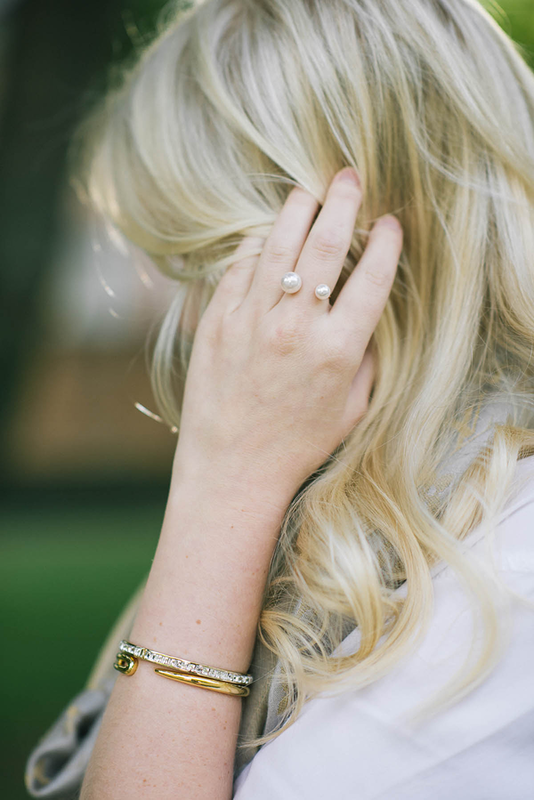 Those rings are too cute! I LOVE the color of your tote! just when i thought i was done shopping you go and post that pretty bag. we’re in a fight now. What gorgeous photos, and I’m in love with the color combination of your outfit! Definitely will be checking out Cuyana’s website. These are such lovely neutrals! That LV scarf is so pretty and I love those pants too! such a chic and neutral color combo! great look! I love this outfit! 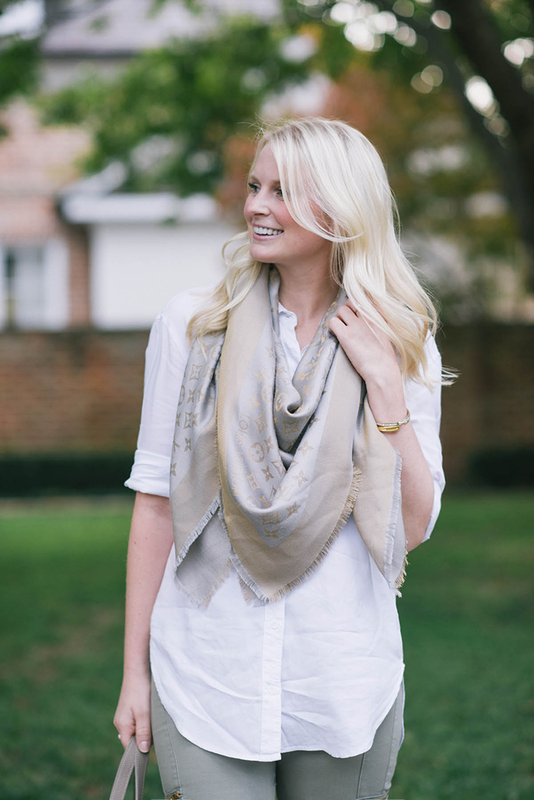 I love how all the tones work together and your scarf with the gold detail brings it all together! LOVE this neutral palette! Those pants are perfect on you and I need those rings immediately! Love these pictures so much! So pretty, Merritt! I love the muted colors in this outfit, everything works so well together and you look stunning. 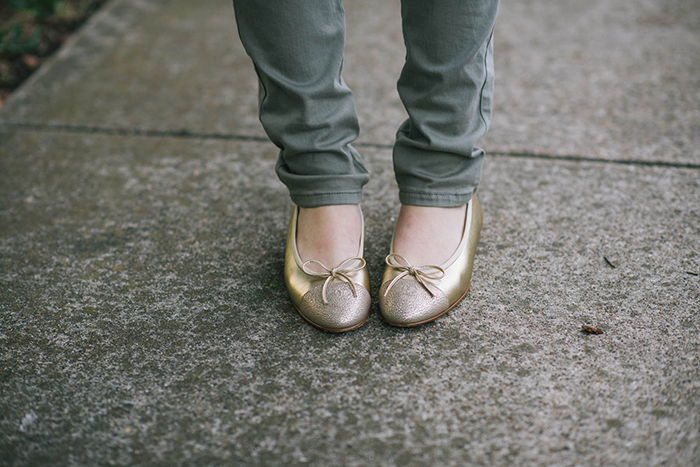 Loving the color palette in this look and those flats are amazing! 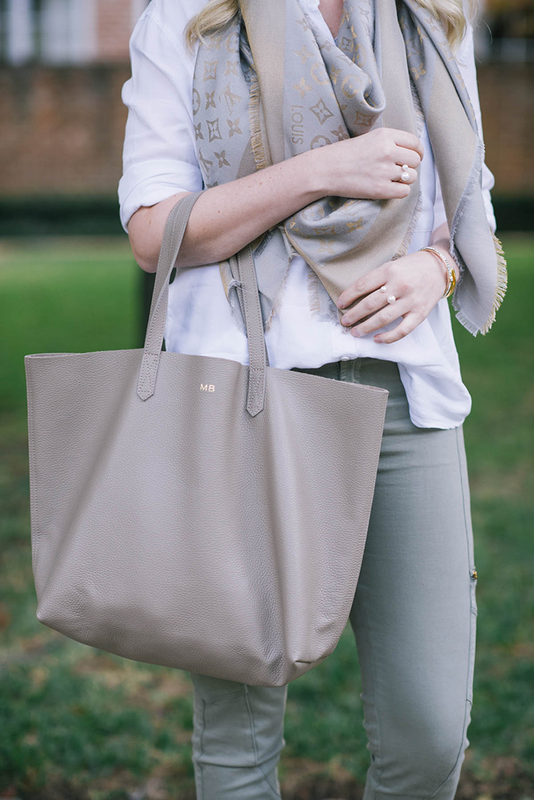 Love this neutral look, the oversized scarf and buttery leather tote are just so cozy & luxurious! I could wear monochromatic every day ! Love! You look beautiful is these neutral pieces. Your pants and tote are amazing.